Quite a few players have stopped their Grade Points from being rolled back in Street Fighter IV by changing their DNS servers to OpenDNS. While this fix has worked for several players, a few people are still reporting the same problems after implementing it. You can find very clear and helpful instructions to implement OpenDNS here. For those of you who are a bit more tech savvy, all you have to do is adjust your DNS settings to those below. In case you're a bit worried about this change, I've personally been using OpenDNS for over a year now and have had absolutely no problems at all with them. I'm also on one of the biggest Internet Service Providers in the nation and OpenDNS' servers have outperformed theirs. Considering this is a free service, and one many people swear by, if you're experiencing trouble with rolling back Grade Points — I'd highly recommend making this switch. Also some players claim this has fixed their disconnection issues, and they're seeing overall better performance online, but your mileage may vary. Thanks go to Azianflavor, TongariDan, Schmeggma and many other people on the EventHubs.com forums for their help. Blazt The Speakerz and CSVagrant put together a nifty combo video featuring Ryu and Ken from Street Fighter IV. The clip starts off with easier stuff, but it gets going soon after. While most of these combos aren't practical in a game setting, by watching it you may find a few things you didn't know were possible that you can add to your arsenal. Another thing to note is how much damage scaling starts happening on some of these bigger combos. G4TV.com caught up with Seth Killian and they chatted about SFIV's Championship Mode update, the National and World tournaments and character rankings. Also Seth mentioned that the Street Fighter franchise has multiple possibilities for the future on the table right now. While future SF details won't be announced at this year's E3, something tells me we won't have to wait a long time before we hear about the next upgrade or iteration to the Street Fighter series. The Dogface Show has posted part two of their interview with Seth Killian of Capcom and MrWizard, the main guy who runs Shoryuken.com. In this segment the guests talk a lot about the EVO Fighting Game Championship and what users can expect if they show up. Part 3 should be posted in another week or so, when it's up, we'll have a link here. The legendary Alex Valle was featured in a Kotaku article which talks about how he got into the Street Fighter series. Alex discusses his early years playing the game and there's a few quotes about his aggressive style of play from other competitors. He also seems to have fairly strong opinions about online play vs. playing in person. Here's a clip the piece. "Arcades are where you can truly level up your game against many opponents with no lag issues or rage-quitters," Valle says. "Maybe those rage-quitters can still leave mid-match and cause a scene or something. Playing online on a console is more of a tool for execution and strategy." In short: Play online if you want to practice, play in arcades if you want to fight. So, what do you think? Do you agree that playing online is just a way of improving execution and strategy, and playing in person is the true test? Capcom of Japan has issued a statement apologizing to PlayStation 3 players for Battle Points, Grade Points and Championship Points not updating properly for some Street Fighter 4 users. The Google translation is a little rough, but you can make out some of the details for yourself. If I'm translating the page correctly, they also mention that a few players have had trouble with being disconnected while voice chatting and trying to upload or watch replays. In the statement they say they're investigating the matter and hope to have a solution soon. Good news for those of you having issues online, as Capcom is looking into the problems. The story from IGN.com is that Capcom is going to release 9 new games on the Wii before April 2010. While it doesn't get into specific titles, the article states that one of their goals is to bring major franchises to the system. One of Capcom's biggest franchises, if not the biggest, is Street Fighter, and with a Wii install base of almost 50 million units world wide — double what the current PlayStation 3 userbase is — they'd be foolish not to put out more titles on the system. A controller that works well for fighting games might be a bit of an issue, but considering how they're approaching Street Fighter IV's PC release, having a pack-in controller option doesn't seem out of the question. So if a Street Fighter title besides Tatsunoko vs. Capcom is going to hit the Wii, how do you think it will pan out? Does it matter much if the graphics are dropped down a bit if the game play is there? And would you actually buy a Wii Street Fighter game if it were available? New business model for arcades? 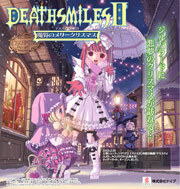 BeefJack and VersusCity reported that Cave, a Japanese developer, is exploring a new business model for arcade machines with the release of their title DeathSmiles II. Besides having a ridiculous name, the game will be shipped to select arcades for free with the vendors and Cave splitting the profits from the quarters dropped in. Considering how much these machines cost and how the console gaming experience has grown, this is an interesting approach. A full on Street Fighter IV cabinet could run upwards of $20,000 and for an arcade vendor to make that kind of investment to not have it pay off ... well, you can see why a lot of arcades have gone under. While it's highly unlikely the arcade scene will ever be restored to what it once was, this might help keep the current scene around awhile longer. One also may wonder if Capcom will look at doing this with future Street Fighter titles. Previously we posted links to some of the artwork from the Street Fighter Jab Strong Fierce art exhibit that's being held in Southern California, but GameSetWatch also captured a bunch more photos of the pieces at the show. Some of the images are off the wall, but they're still very good regardless. If you're into art, it's definitely worth checking out. The exhibit closes down today, so it's your last chance to go if you're interested. Sumthing Else Music Works has signed on with Capcom to distribute their video game music soundtracks, including Street Fighter IV. Here's a clip from the press release. New York - May 11th, 2009 - Sumthing Else Music Works, the premier label dedicated to licensing and distributing video game soundtracks, is delighted to announce that it has entered into a multiple-title licensing partnership with Capcom, a leading worldwide developer and publisher of video games, to release the original soundtrack albums for best-selling franchises including Bionic Commando, Resident Evil, Dead Rising, Street Fighter and Monster Hunter. Under the terms of the agreement, Sumthing Else Music Works will license Capcom's catalog for distribution on digital and physical formats in North America. Physical CDs will be distributed by Sumthing Distribution and digital releases will be available on Sumthing Digital www.sumthingdigital.com and iTunes. Several people have reported that their new Standard Edition Mad Catz FightSticks are not experiencing the moving washer issue, although some are still getting joysticks that have that problem. A little background, if the washer on the joystick moves, it can get out of place and your joystick will 'catch' a bit preventing completely unhindered movement. If you have experience with modding joysticks, the fix is simple. Open up your Mad Catz joystick and superglue the washer down (instructions). It sounds like newer models have resolved this issue, but since there's still a few older models floating around — that's likely why you're still seeing reports of it not being fixed. Also Capcom and various other retail outlets are still filling back-orders on the Mad Catz sticks, and they're expected to be doing so until some time this month. After all of the back orders have been sent out, the Capcom store and other places will be opening up both the Tournament Edition and Standard FightStick again for retail sales. The goal is to get a Mad Catz stick in the hands of anyone and everyone who wants it. When sales open up again, you'll see a news post here on the EventHubs.com front page. Also for those of you having recurring problems with buttons that randomly stop working, some players have also reported success with swapping out the breakway cable on the XBox 360. Although this doesn't fix the issue, it did lessen the frequency of how often it came up. The matter can also still be resolved by simply unplugging and plugging in the joystick again. The American Street Fighter IV champion, Justin Wong, commented in an interview that he's the player to beat at this year's EVO 2009 Fighting Game Tournament, even after losing 0-4 against Daigo Umehara's Ryu in the World Competition. That original interview didn't provide a lot of detail on why he thought this was the case, but Gamenook caught up with him and a few friends and they cover the subject a bit more. The clip above gets to the most interesting part of the interview right away, but you can also check out part 1 here as well. Justin also says his own personal tier list for Street Fighter IV is Seth, Sagat, Ryu and Zangief. He mentions this a bit after he claims that Sagat is overrated. So, what do all of you think of the explanation given? We've added a new feature to the front page of EventHubs.com. Now you can easily go back in time to browse older stories you may have missed with our paginated front page. All of you have to do is scroll down and click one of the numbered or Next links and you can browse our new archives with article text and images. Most of you have probably noticed that after a number of hits, your combos don't quite take off as much power as you thought they would. This is something built into Street Fighter 4 called damage scaling, and it reduces the amount of life you take off in combos, after a certain number of hits. This is a function added into the game to help negate the impact of infinites and really large combos — among other things. We posted a guide that explains combo damage scaling so you have a better idea how to put together your combos for maximum damage and efficiency. Gigantic kudos go out to Genotox, Buktooth and Yeb for collecting information and putting it up for everyone to check out. Christian Svensson updated his blog on Capcom-Unity with more details about the PC version of Street Fighter IV. Here's the interesting stuff in bullet points. The game will retail for $39.99 and ships on July 7th. Best Buy customers will get an Eagle One animated DVD with the game. For $59.99 you get the game and a PC/XBox 360 Mad Catz FightPad, the bundle is a limited edition run, so once it's gone, it's gone for good. You'll also be able to buy the game from digital distribution areas, like Steam, Impulse, Direct2Drive, Metaboli, Gametap, Nvidia.com and GamersGate. The Street Fighter 4 guide for Blanka here on EventHubs.com has undergone heavy revisions recently. Not only has the main guide been revamped to provide better details on how to use each of his moves, but there's new combos, strategies and general tips on how to raise your game while using the beast. Also we've added in a video page and character match up notes, to help you with some of the specific fighters you'll face while using him. You can also find older sections for his frame data and challenge mode trials. As always, if you'd like to add anything to the guides on the site, please leave a comment in the appropriate section. Kudos go to SuperGolden, The Mullah, tatatan1, LatinDiveman, Tinshi, MAGUS1234, Viscant, ElectricBalls, Mijnjiku and MOD for their contributions both large and small. Capcom's latest financial report has been released, and they break down their top 44 selling games ever. Street Fighter IV has made a nice initial showing, but it's also cool to check out how old Street Fighter titles performed on the list. Here's how the top 10 looks. Here's some other notable games from their top 40. If you want to go further, you can check out the whole list here. It's pretty interesting to see which games are and are not up here. The only Alpha title that cracked the top 44 was Alpha 3, and not a single Vs. title made the list.